Last night I did random searches at Newspapers.com, looking up people I’ve checked before. Repeating an identical search can bring different results, since new papers are added and as older issues are digitized and made available. Daily News (New York, New York), Brooklyn Section, Sunday, 17 April 1927, p.265, col.1 ; digital access, Newspapers.com, accessed 29 June 2018. Asbury Park Evening Press (Asbury Park, New Jersey), Saturday, 24 Jan 1920, p.9, col. 3 ; digital image, Newspapers.com, accessed 29 June 2018. I have a photo album of pictures taken in what we think is Ocean Grove, New Jersey, about 1922. But given this ad, and reviewing newer information found about the people in the photos, I believe they were taken in the summer of 1920 at the “bungalow” located from the ad. Here we have my great-grandmother Charlotte McCormick Flanders (right), next to her mother Alice Heginbotham McCormick. Next to Alice is her son, Charles McCormick and his wife Mildred Hartt McCormick. Taking the photo was probably my great-grandfather, who does appear in other pictures in the album. 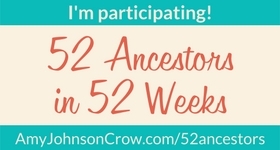 I’ve been off my game in the ancestor profile writing campaign after the death of my father, but I’m still commited to writing about those who came before me. Look for more stories soon – there’s a long list of people who need to be written about! Categories: Genealogy | Tags: amcestors, Family, history, newspapers, resources | Permalink. Condolences on the loss of your father, Anne. Will look forward to more from you when you find time.